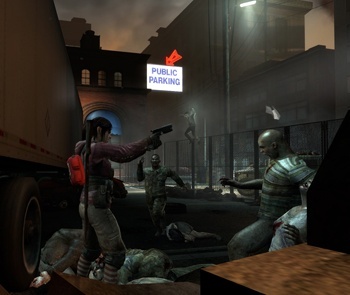 A couple of weeks ago I took a break from regular Gears of War 2 sessions to play the much-anticipated Left 4 Dead demo. I had high hopes for Valve's zombie survival shooter. Having played through a full co-op scenario at PAX, I was relatively certain that Left 4 Dead would be my multiplayer game for the rest of the winter. After burning through a few co-op demo sessions with friends, though, I wasn't feeling it. The ingredients for a game I thought I'd love were in place: atmospheric environments, fast-paced FPS gameplay, powerful weaponry, and a ravenous zombie horde. All done with trademark Valve attention to detail. But something was missing. After giving it some thought, I narrowed the source of my Left 4 Dead demo dissatisfaction to a nagging sense of disconnectedness. As I ran through its well-laid-out maps, the world felt arbitrary and artificial. I didn't feel like a hapless human winding my way through a threatening environment. I felt like a camera moving through a map. To be fair, most modern videogames boil down to a camera moving through a 3D map, dressed up with all sorts of visual and audio cues designed to provide some semblance of realism and interactivity. For some reason, Left 4 Dead's Source-rendered environment, with all its beautiful lighting and blood-spattering decals, wasn't convincing me. I had the same problem with Team Fortress 2. As smart and stylish as Valve's remake was, it didn't thrill me as it did so many others. As I careened my way around its beautiful maps, employing the tactics of its various classes, I didn't feel I had any real presence in the environment. I felt like I was stuck in a box of bees, glancing off the walls in a swarm of activity. After failing to fall head-over-heels for both Team Fortress 2 and Left 4 Dead, I found myself wondering what my problem was. Why could I play Gears of War 2 night after night while Valve's worthy contenders had failed to hold my interest? Half-Life 2 and its episodes didn't leave me dissatisfied, so it certainly wasn't something endemic to Valve. What was the deal? After mulling it over, I think I've figured it out. Most of the games I've recently loved have given me something Team Fortress 2 and Left 4 Dead haven't. Namely, a convincingly physical connection to the game world. Gears of War 2 creates this connection by forcing you to navigate through cover, repeatedly interacting with the space around you in order to make it from point A to point B. Unless you're crammed up against pieces of the environment, crouching and shooting from solid cover, you won't survive. And you don't merely duck behind walls and pillars. You slam into them with convincing force, desperately cramming yourself into safety. It makes the world feel essential and real. Rainbow Six: Vegas and Vegas 2 don't employ the same teeth-rattling covertaking methods, but they do force you to work from cover point to point in an equally methodical manner. And there's no part of the Rainbow Six world that doesn't matter as you carefully peer around corners and under closed doors. There's something about the way your character pops from behind cover, sweeping the area from a zoomed-in view, that feels tangible and dangerous.